Encoder Motion Sensing Products - Absolute and Incremental Encoders | PICS, Inc. Incremental encoders can provide a once-per-revolution pulse (often called index, marker or reference) that occurs at the same spot of the encoder shaft revolution. Incremental encoders are available in two basic output types, single channel and quadrature. A single channel encoder often called a tachometer, is normally used in systems that rotate in a single direction and requires simple position and velocity information. Quadrature encoders have dual channels (A and B), phased 90 electrical degrees apart. These two output signals determine the direction or rotation by detecting the leading or lagging signal in their phase relationship. Quadrature encoders provide very high speed bidirectional information for very complex motion control applications. Tru-Trac encoders are perfect for linear applications and can be mounted above or below the moving object. A spring loaded torsion arm allows the tension on the wheel to be adjusted, so the measurement can be obtained for a variety of different surfaces. Model LCE encoders are a cost effective linear solution up to 50”. Applications include servo motor control, specialty assembly machines, digital plotters, robotics, and high power motors. The Model 260 is great for many machine and motor applications because of its larger bore and low profile build. 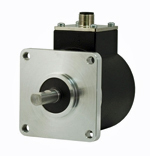 These encoders attach reliably with EPC’s innovative anti-backlash mounting system. Applications include brushless servo motor commutation, robotics, motor-mounted feedback, assembly machines, digital plotter, and high power motors. The Model 25T has an innovative high performance design that has the largest Thru-Bore available for its low profile design. Features EPC’s Opto-ASIC sensor which provides superior precision counts and accuracy. The Model 711 is the industries original standard cube encoder. Most programmable controllers, electronic counter, motion controllers, and motor drives are compatible with this encoder. Applications include feedback for counters, PLC’s & motors, filling & materials handling machines, wire winding, film extrusion, and measuring for packaging. The Model 15s is ideal for commercial and light-duty industrial applications that require a high performance feedback solution. Has a precision bearing set with a durable stainless steel shaft, and a selection of face mount items. Applications include servo motor control, medical diagnostic equipment, printers, robotics, digital plotters, typesetting equipment, and assembly machines. The Model 725 is designed to be tough enough to handle the challenges of an industrial environment. The housing features a isolated internal encoder unit that protects it from severe axial and radial shaft loading. Applications include conveyers, motion control feedback, textile machines, material handling, elevator controls, machine control, food processing, process control, and robotics. The Model TR1 is a spring loaded measuring wheel assembly integrated with an encoder in one easy to use compact unit. Great solution for tracking velocity, position, or distance over many different surfaces in any orientation you put your TR1 in, even upside down. Applications include web tension control, document handling, labeling, paper monitoring, linear material monitoring, glue dispensing, printing, and conveyer systems.